This is Bruce, my husband, doing his old job.... as a locomotive engineer. Thirty eight years passed by, although it felt slow at the time! Those days and weeks do end up reaching a goal eventually. He did work at another job in a different field for approximately ten years and is now fully retired. He has a birthday with a zero in it later this month and it gives you a pause to think on it. I know, I have my own 'zero' coming up too in March. He keeps busy on line doing consignment sales for people downsizing their model railway hobby (or expanding it) and he also keeps a blog where he write his (98% true) railway stories. Its been a while since he last wrote but several people, including me, are nudging him back to the keyboard. He's a wonderful supporter of my weaving endeavours, and also an invaluable help in the studio and lends a hand when it comes to beaming a warp. I get everything all set up and ready. Then he winds the back beam and I tension and detangle. We usually have a good chat about what ever is going on, or listen to some music and sing along. We use brown wrapping paper as our separator (which we buy at the post office as it seems to be the right size, price and is sturdy). It gets to be a 'personal challenge' to see if he can get the paper on and keep it winding straight. Many of you might know how frustrating it is to have it going off wildly off track. I would cut it off, fold the edge over to straighten and carry on. Bruce got creative! He noticed I had a length of half inch PVC pipe which I normally use to hang up and dry shawls over standing in a container. He placed the PVC rod through the centre of the roll of paper and then nudged it back against the edges of the down treadles. He has the leading edge folded perfectly straight and uses the apron rods to line up and we start to beam. Bruce uses his feet and toes to gently tension the rod and the paper slides off under control and no wandering! He's such a clever clogs! We decided to take photographs and show the technique to you. This was 100% his idea and I must say it really works. No fighting with the paper and the six and a half yard warp went on very quick. There's going to be some colourful show and tell soon.... stand by! So that last project was fun to weave up and see the colour effect! I thought "let's try that again"! This time I used four colours instead of three: Navy blue, grey blue, whipple blue and baby blue. All 8/2 tencel and sett 24 epi. I have a nice selection of colours to play with at a time like this. Again, it was awkward to photograph effectively! But it was clear that there was a completely different look and feel to the project. 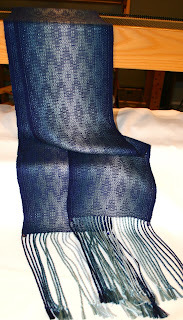 The warp width and length was the exact same: 8.41" at the reed and 6.5 yards. 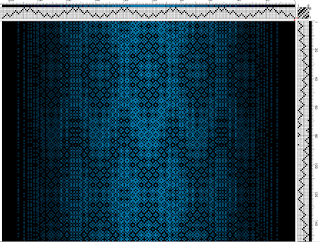 The scarves were woven the same way: network and as-threaded. 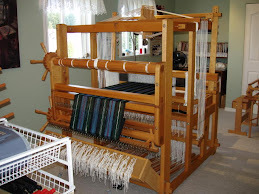 The weaving went along well and I was pleased at how my knee was feeling with the exercise. It did swell slightly by the days end so I would elevate it and keep an ice pack on it.... plus pour a cold, well earned drink for me. Endless days of rain was the perfect weaving weather in the quiet days of late January. 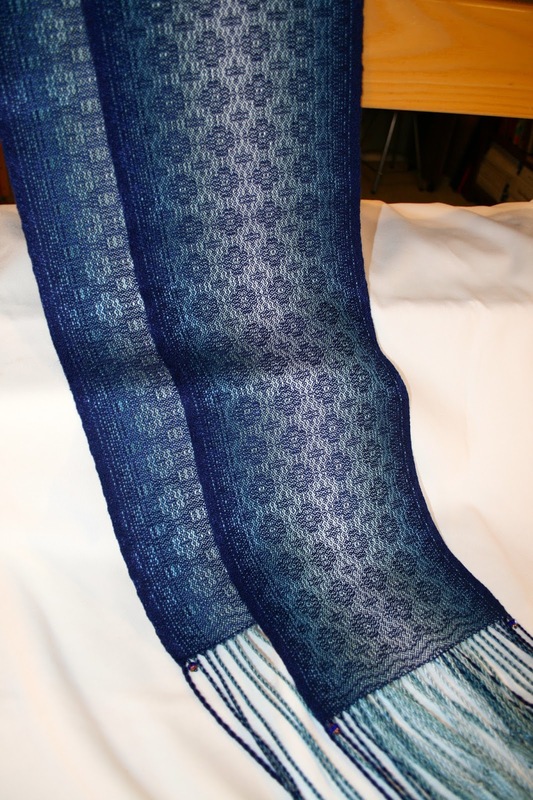 Below is the woven 'as threaded' scarf. Once again it has the look of flowers or circles and they are much more visible with this colour arrangement. 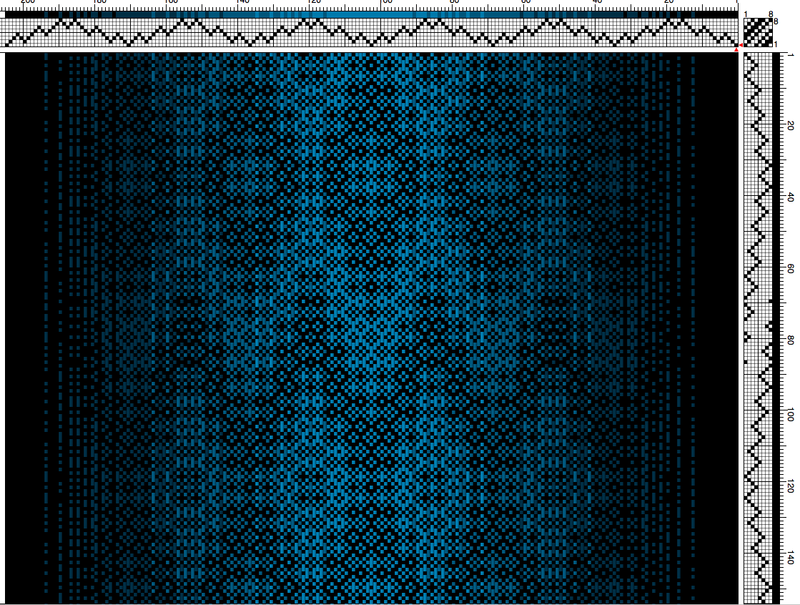 It looks sort of flat but that's due to my arrangement to show the pattern off. The tencel is soft and silky with a lovely drape and cool hand. I see either one of these paired with jeans and casual wear quite nicely for Spring. The network scarf requires only ten repeats to equal one scarf. The repeats are six and a half inches long! 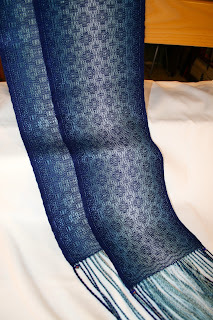 This one has some bead accents hand sewn in off the loom as part of the finishing. Again, I had to drag every light into a huddle to shoot these pictures..... and today the sun came out in all its glory as I write. I might try retaking the pictures and see if it makes a difference! So here's a sneak peek at the next project..... to keep you coming back!